Whether you’re giving an important presentation, writing an email, or participating in a brainstorming session, it’s important to be able to communicate in a way that your audience can easily understand. When you are communicating, especially in a business context, it can be difficult to convey your message in a clear and concise way because there are so many factors to take into consideration. The communication process can help ensure you construct and deliver your message to the best of your ability. Any time we share information with others we are communicating. In fact, the word communicate derives from the Latin word communicare which means “to share “or” to make something common”. Communication is the exchange of information between two or more people who convey intended meanings through a shared system of rules, such as the English language. Verbal: includes face to face, presentations, telephone, television, Youtube and other media. Non-verbal: includes body language, facial expressions, eye contact, personal appearance, and smell, amongst others. Written: includes email, letters, magazines, books, the internet, Facebook, and Whatsapp, amongst others. Visual: includes drawings, graphs, and charts, amongst others. Understanding the Communication Process can help you to communicate your message more effectively. It can help ensure you construct and present your message to the best of your ability. The process ends in a feedback loop, where the feedback you receive can help you to further improve your communications going forward. There are many different communication process models in existence. The one we’ll look at is the most widely used and the first one published, known as the Shannon-Weaver model. It was developed by Claude Elwood Shannon and published with an introduction by Warren Weaver in 1948. Sender: The person who wants to communicate. Message: The information the sender wishes to communicate. Encoding: How the message is to be communicated e.g. verbally or written. Channel: How the message is sent e.g. face to face or by email. Receiver: The person to whom the sender sends the message. Decoding: How the receiver understands or interprets the message. Feedback: The receiver’s response to the message. Noise: Anything that might interfere with communication or reduce the chance of successful communication. The sender will decide on the aim of their message and who the receiver is. From this, they will construct their message and determine how it is to be sent. To avoid miscommunication it is important for the sender to keep their audience in mind when constructing their message and selecting their channel. Decoding begins when the recipient has received the message and starts to digest it. If the receiver is confused by any part of the message the feedback loop enables them to seek clarification by asking questions. The feedback loop also provides a mechanism for the receiver to provide both positive and negative feedback to the sender. Psychological Noise: This type of noise comes from within us, for example, our preconceived stereotypes, our biases, our beliefs, and our assumptions. Physical Noise: This is any type of noise that distracts us, for example, loud colleagues talking around you or listening to music. Environmental Noise: This type of noise comes from the environment around us, for example, passing traffic. Semantic Noise: This type of noise is created by the sender, for example, using technical language or verbose language. 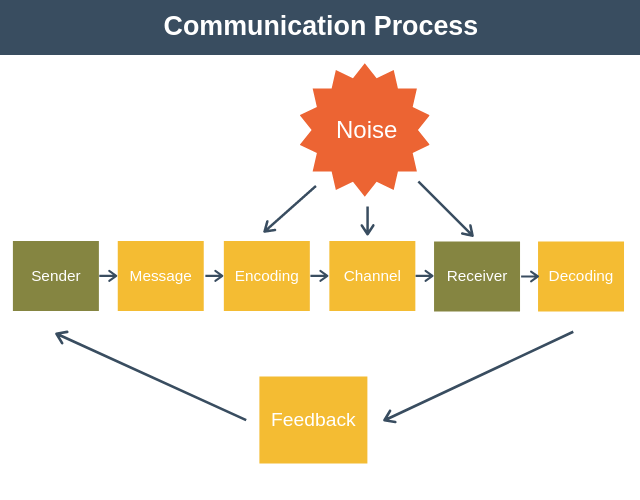 Semantic noise usually happens because the sender has failed to target their message or channel to the needs of the receiver. Who do you want your message to reach? What action do you want your receiver to take after receiving your message? What information your receivers need the message to contain? Now you have your basic thoughts on the message formulated it’s time to compose your message. Determine how you are going to communicate your message e.g. face to face or by email? Is your audience knowledgeable about the topic in question? Does your audience prefer high-level big picture information or more detailed information? Do you need to provide any supplemental information? Does your audience have any preconceived ideas or assumptions that could reduce the effectiveness of your message? Can you think of any other obvious noise that might occur? If so, can you address it? What is the right time to deliver your message? Is there any way that you can reduce your receiver’s distractions? Receiving feedback is an important stage in the communication process. If you fail to gather feedback then you won’t obtain any insights into how to improve this communication or future communications. Have you included a process for collecting feedback? You could simply ask directly for feedback or create a form/questionnaire for everyone to complete. Have you allowed time for questions and answers if you’re giving a presentation? Can you pick up from other signals being given e.g. body language or what’s not being said? If it’s valid, then how can you use this information to improve your next communication? If things didn’t go the way you wanted, what could you have done differently to achieve the response you wanted? Marc is a marketing executive who wants to give a presentation to his executive board to request further funding for his department. Let’s work through each of the questions outlined above to see how Marc can use the communication process to help him communicate to the best of his ability. Identify all the people you want your message to reach. Marc’s message needs to be heard by all the executive board and especially the CEO. Identify what action you want your audience to take after receiving your message. The CEO will approve the extra budget that Marc is requesting. Identify what information your receivers need the message to contain. The lost opportunity in the marketplace if they don’t approve the increased budget. The sense that this opportunity might be captured by our competitors. The strong return on investment of this budget increase. Determine how you are going to communicate your message e.g. face to face or email? Marc decides the best way to deliver his message is face to face using a presentation. Is the audience knowledgeable about the topic in question? No, so Marc will try to focus on the opportunity in his presentation rather than the details of how the budget will be spent. They prefer big-picture aspirational information. Although the executive board prefers big-picture information they also like to know that the detailed analysis has been done. For this reason, Marc will include the detailed data in an appendix for the board to examine after the meeting should they choose. Marc identifies that laptops and cellphones could distract from his message coming across so decides to ask for them to be switched off for the duration of his presentation. Marc also identifies that the head of finance’s default position is to be adverse of increasing the budget of any department. For this reason, Marc decides to organize a face-to-face one-on-one meeting with the head of finance in advance of the presentation. The aim of this meeting to take the head of finance through his plan, address any concerns they have, and win them over in advance of the presentation, so that they don’t raise any objections during the presentation. This should allow the presentation to go more smoothly. The only time Marc can really deliver his message to everyone required is during the monthly executive board meeting. Nothing in addition to asking for laptops and cellphones to be turned off. There will be a Q & A session at the end of the presentation. Yes. Marc has scheduled 10 minutes for Q & A at the end of his presentation. Maybe. Marc decides to reflect on this after the presentation. After the presentation, Marc will examine the comments made and think about how they can be used as input to improve his future presentations. The Communication Process is an eight stage communication model that can help you to improve your communication skills. 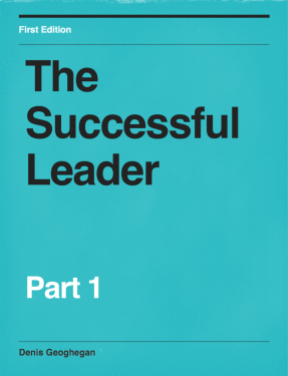 While the model may seem obvious and something most of us do naturally, breaking communication down into its constituent steps and forcing yourself to think about each step can help you improve the effectiveness of each communication you originate. Ensuring you receive feedback on each communication you originate will also ensure your communication skills continue to improve over time.